Who put the Swiss in Swiss steak? In my July 13th posting “Swiss steak” I deprecated the popular idea that a verb swiss lies behind this usage and suggested reverting to the simple proposal that Swiss is just the nationality Adj, but that the composite Swiss steak is not predicational — Swiss steak is not Swiss, but American — and is instead relational, entailing only that Swiss steak is related to or associated with Switzerland in some way (perhaps by virtue of the ingredients or techniques involved in its preparation). But investigating any proposal about the origin of the expression requires assembling much more evidence than I had available to me in my searches on the net: many more, and earlier, examples, with rich information about the cultural context surrounding them. A notable step in this direction has now been made by Peter Reitan, who has access to large newspaper archives and experience in using these resources. He reported on his initial explorations in a short posting to ADS-L yesterday, a note suggesting that 19th-century occurrences of Swiss steak indicate that the term might have originated along the Ohio River in southern Indiana, in an area where Francophone Swiss settled in the early 19th century. There is suggestive evidence that there may be a connection to early Swiss immigrants to southern Indiana along the Ohio River. The earliest reference to “Swiss steak” I could find is from 1892 in southern Indiana. The second earliest reference, and earliest recipe, I could find is from 1895 in southern Indiana. Consistent with the immigration data, nearly one quarter of the hits for searches of “swiss steak” on newspapers.com come from Indiana and Ohio – MANY more hits for each of those states than for any other individual state. Limiting the search to before 1930 results in even higher percentages of hits being from Indiana and Ohio. This suggests that the dish may be a regional favorite, perhaps influenced by the early Swiss settlers along the Ohio River. Curiously, the early recipe recommends the best cut of beef, does not mention pounding, and finishes with a brown gravy, not tomato sauce. Reading between the lines, the “Swiss” method of cooking appears to refer to the covering with flour and slow simmering in water. “Swiss steak” appears in a number of cookbooks in the early 1900s, and many of the early recipes do mention pounding and some of them use tomatoes. Components. Before I go on to the Swiss in 19th-century Indiana, two general remarks. First, about the elements or components of the dish referred to as Swiss steak. Its principal ingredient is a boneless piece of beef of modest size. Then there are a great many varable elements. When Pete notes that the 1895 recipe “recommends the best cut of beef, does not mention pounding, and finishes with a brown gravy, not tomato sauce”, he alludes to four components of preparation; and when he refers to “the covering with [or dredging in] flour and slow simmering [or stewing] in water”, he adds three more. component 2: processing the raw steak — pounding, flattening, or cubing by meat mallet or electric tenderizing machine (to yield cubed steak or cube steak). Various treatments to make the steak flatter and/or tenderer. The 1895 recipe doesn’t call for pounding or cubing, but it does tell you to “flatten” it to make it “as smooth as possible”. component 3: cooking the steak without vegetables; with only chopped onions or garlic; with mirepoix vegetables (chopped onions, carrots, and celery or celeriac); also with chopped bell peppers and/or mushrooms and/or a chopped root vegetable like turnips or parsnips; and with tomatoes in some form. The 1895 recipe lacks vegetables entirely, though almost all other recipes call for some. Tomatoes are a crucial variable (call it component 3a): many modern Americans insist that without tomatoes it’s not Swiss steak, period, but at least one (Wilson Gray on ADS-L) reports never having encountered Swiss steak with tomatoes in it (Wilson, who is black, wondered if that was generally a black thing, or just his personal experience). component 4: finishing the dish with a brown gravy, a vegetable sauce from the cooking liquid, or neither. component 5: rubbing the raw steak with or dredging it in flour — vs. leaving it plain. Some Swiss steak recipes dispense with the flour. component 6: slow cooking (simmering, stewing) in a liquid, fast sautéing (frying, searing, browning) in fat or oil, or both. The 1895 recipe calls for both: first the rapid browning, then the slow simmering. Some Swiss steak recipes dispense with the searing, but so far as I can tell, all involve stewing. component 7: water as the liquid — vs. broth (chicken or beef), red wine, brandy (or some other distilled liquor, like bourbon), or some combination of these. Given that the area around Vevay in southeastern Indiana was settled by wine-making Swiss, it’s a bit surprising that the Indiana recipes don’t use red wine, but that just might reflect the change in social customs from the early 19th century, when everyday drinking of beers, wines, hard ciders, and distilled liquors was widespread, to the more abstemious practices of the late 19th century (partly as a consequence of waves of religious revival movements during the century). component 8: dealing with the raw steak as a single piece; slicing it into strips; or cutting it into chunks. The 1895 recipe just uses the piece of steak whole, but many later recipes have it cut up (among other things, this increases the surface area of the steak affected by the cooking procedures). component 9: the cookware: simmering with an open top (allowing water to boil off, so that the liquid either concentrates intensely or must be replaced periodically during cooking) or slow steaming in a closed container — some kind of Dutch oven, a pressure cooker, or a crock pot. The 1895 recipe goes for simmering with replacement of the liquid. I don’t know that these cookware differences make any difference in taste or texture, but they do potentially differ in the length of cooking time. Originalism. Second, a warning about how we understand this search for the earliest uses of Swiss steak in their cultural setting. The point of the exercise is to figure out how the expression Swiss steak came to be used for a partcular food preparation, not to determine what the original, “true”, meaning of the expression is. The dish Swiss steak is an item of culture, and like other items of culture, it will have a complex history, with precursor dishes (possibly with a variety of names) that eventually crystallize into an item of culture (with certain characteristic functions and forms and with a conventional name), but like any item of culture, this one will be subject to both variation and change. 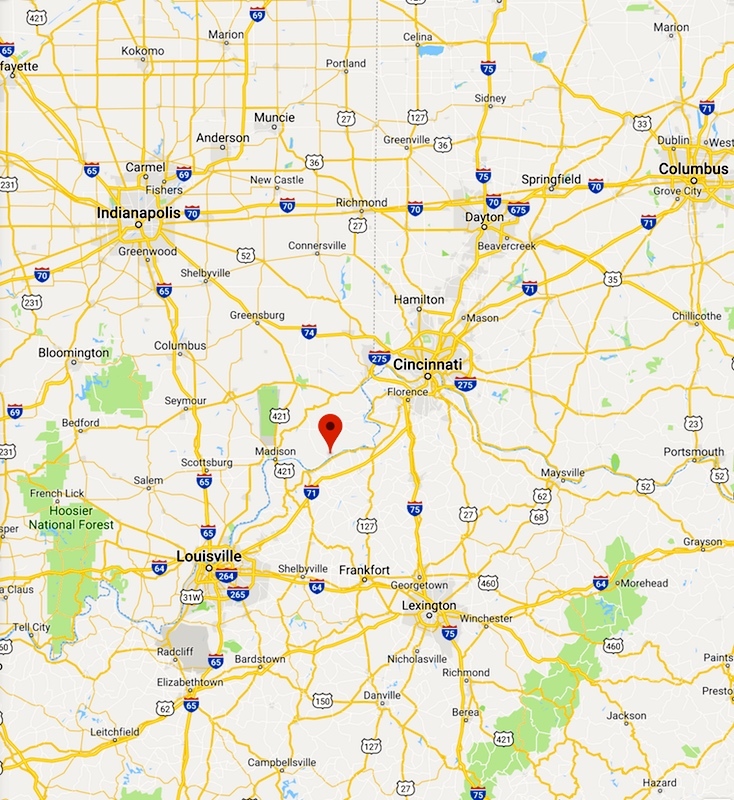 Vevay is a town located in Jefferson Township, Switzerland County, Indiana, United States, along the Ohio River [at the southeastern corner of the state, on the Kentucky border]. It is the county seat of Switzerland County. The population was 1,683 at the 2010 census. Vevay was founded in 1802 by Swiss immigrants intending on cultivating grapes and producing wine. It was named after the Swiss town of Vevey. Vevay has a reputation as being home of the first commercial winery in the United States [founded in 1806 or 1807 by John James Dufour of Vevey]. When Switzerland County was formed in 1814, Vevay was made the county seat. Switzerland County [the only Switzerland County in the country!] is a county located in the U.S. state of Indiana. As of 2010, the population was 10,613. The county seat is Vevay. Switzerland County was formed in 1814. It was named for the home country of many of the early settlers. No railroad tracks were ever laid in Switzerland County, which hindered its growth in the 19th century, after the decline of steamboat travel. Industrial wine grape production in Switzerland County earned the area the title “The Rhineland of America” [entirely figurative: the Rhine is on the northern border of Switzerland (the border with Germany, which has its own, extensive, Rheinland), but the settlers of Switzerland County came from the southwestern part of the country, adjacent to France]. Vevey is a town in Switzerland in the canton of Vaud, on the north shore of Lake Geneva, near Lausanne. It was the seat of the district of the same name until 2006, and is now part of the Riviera-Pays-d’Enhaut District. It is part of the French-speaking area of Switzerland. Vevey is home to the world headquarters of the international food and beverage company Nestlé, founded here in 1867. Milk chocolate was invented in Vevey by Daniel Peter in 1875. … The Confrérie des Vignerons (Brotherhood of Winegrowers) organises the Winegrowers’ Festival (Fête des Vignerons) four or five times each century (one per generation) to celebrate its wine-growing traditions and culture. On those occasions an arena for 16,000 spectators is built in the marketplace — the Grande Place, which is the second-biggest marketplace in Europe, after Lisbon, Portugal. The festivals date from the 18th century; the last five were in 1905, 1927, 1955, 1977 and 1999. … The Grande Place is dominated by a granary known as La Grenette, built in 1803 in the Neo-Classical “rustic” style. Behind La Grenette is the restaurant La Clef, in which Jean-Jacques Rousseau used to eat. The table at which he sat is still to be seen in the restaurant. 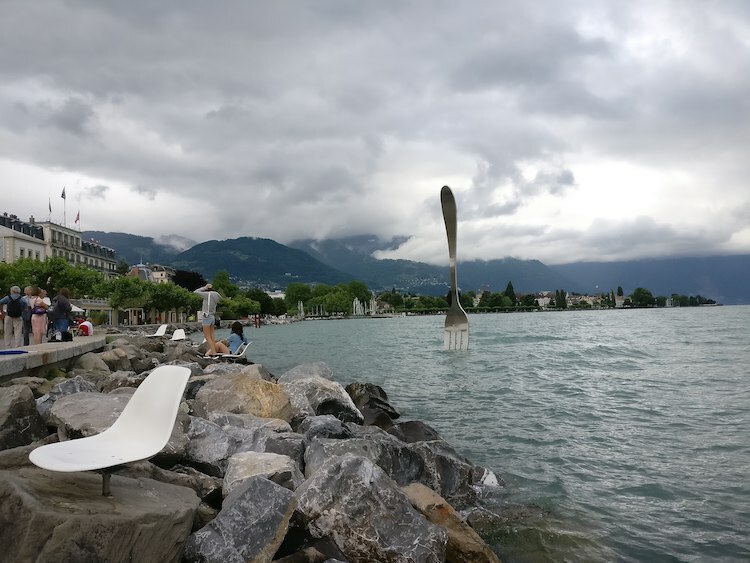 … Additionally, there is a large fork just off the shore of the lake [in front of the Alimentarium, a museum of food]. The fork was originally installed in 1995 as a temporary exhibit. Removed in 1996 and replaced in 2007, it finally got authorization to remain in the lake in 2008 and has become an emblem for the townspeople. This entry was posted on July 16, 2018 at 10:53 am and is filed under Art, Language and culture, Language and food, Lexical semantics, Names. You can follow any responses to this entry through the RSS 2.0 feed. You can leave a response, or trackback from your own site.